Brown’s Business College led to the Horst Building, where Brown’s occupied the second story for several years. Henry W. Horst had built it right across from the courthouse on Second Avenue in 1911, at a reported cost of $25,000. Building records describe it as a garage and its first story was occupied by Horst & Strieter, sellers of Ford autos and trucks. Although Henry W. Horst, was the president of Horst & Strieter, he was primarily known as a contractor, which business he continued from this new building. The active partner in the auto business was a recent graduate of the University of Nebraska, Martin E. Strieter. He was the original secretary-treasurer of the firm and became its president in 1930. It’s easy to imagine this young engineer being inspired by the technical innovations of Henry Ford. Mr. Strieter was a leader in the auto business until selling his dealership in 1946. He was prominent in the local banking business as well. When they opened in 1911, Horst & Strieter introduced Henry Ford’s 1908 breakthrough Model T to the Quad Cities. And the Model T, also known as the Tin Lizzie, is the car seen on the postcard. This one is a brand new two-seater touring car model. A newspaper ad a couple of years earlier noted its cost as $600. A single seater roadster was also available. Notice the big wheels and skinny tires – all the better to navigate bumpy roads. The radiator is shiny brass here, but in later models it was partly covered. The folded down top was made of a leatherette material and the side “windows” were flexible celluloid that snapped in place. The plate glass windshield was hinged to fold down. Glass was extremely dangerous in collisions and many were injured until safety glass became standard. Lowering the top and folding the windshield down was an easy way to increase road speed, at the expense of the occupants eating lots of bugs and dirt. This Model T has two sets of front lights. The first, near the passengers, burned kerosene that didn’t really illuminate much and that were a holdover from the horse and buggy days. The large electric headlights were new on the 1915 Model T. Previously headlamps had been illuminated with acetylene gas from a carbide generator that was mounted on the running board. The new lights were operated by a “low tension magneto” that only worked when the engine was running. The magneto, part of the flywheel assembly, also operated an electric horn – no more rubber bulbs to squeeze. Because the magneto was part of the engine flywheel, its power output and hence the light intensity was related to the engine speed. Want brighter lights? Just rev the engine. Notice the luggage strapped to the sides – these cars didn’t have a trunk, although one could be added as an accessory. But the car is only half of the story. Rock Island to California…..California! Two thousand odd miles away. How would they get there? The good guess here was via the Lincoln Highway. After all, the first Official Lincoln Highway Road Guide had finally been released just two months earlier. The Lincoln Highway was a 3400-mile coast to coast, New York to San Francisco, road conceived in 1912 by Carl Fisher, founder of the Indianapolis Motor Speedway. Initial plans called for it to be graveled at a cost estimated as ten million dollars. And ideally the gravel would be installed in time for an estimated 25,000 autos to cross the continent for the 1915 Panama-Pacific Exposition. While the gravel didn’t get finished, the map did. This leads to a look at those roads these travelers might have encountered. Although cities were paving their streets by this time, the lightly traveled countryside was a different story. In rural areas, many roads were still dirt. Where a gravel road had been installed, it was usually only one lane wide and paralleled the dirt road – in dry weather, the dirt road was usually smoother than the gravel and provided a quiet and peaceful ride. Both kinds of roads were dirty. Plumes of dust would announce a traveler from a mile away – not so good if you were driving another auto in his plume. 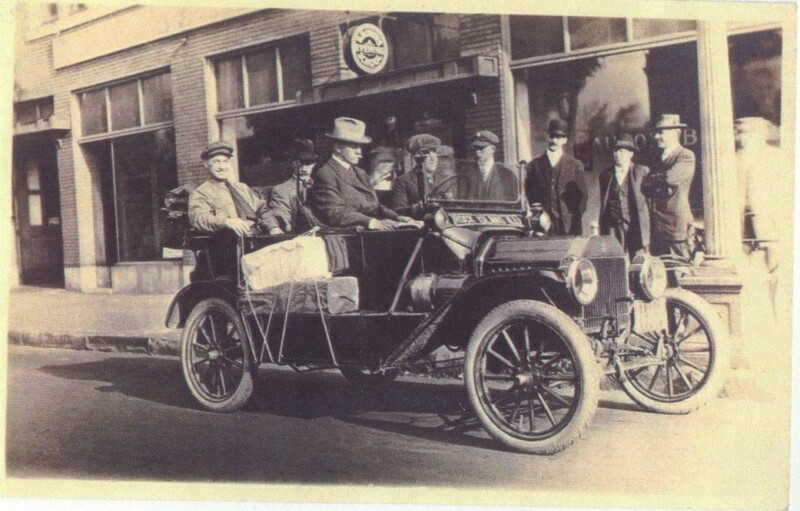 Eight years after the postcard photo, Frank Looby, a young employee of Horst & Strieter, took a cross-country trip in his new Model T. In 1975, the Argus published the story he told. Although the roads must have been in better shape than they were in 1915, Mr. Looby recalled that he went through twelve tires and 48 patches. Even worse, he broke several leaf springs and an axle. Potholes may be an understatement in this case. Back to this mystery postcard. We couldn’t identify the travelers – and we don’t even know if all four were intending to travel or were just posing in the car for the photo. Did they make it to California? How long did it take them? And did they drive all the way home too? There’s a story here, but we’ll just have to use our imagination because we don’t know the facts. Isn’t that how novels get started? And we can’t start with the Horst Building. It is long gone, with the property first used as a parking lot for the nearby dairy and later incorporated into the Centennial Bridge access. This article by Diane Oestreich is slightly modified from the original, which appeared in the Rock Island Argus and Moline Dispatch on September 8, 2002.